Charging your glucose monitor with a wireless solution! The wearable Continuous Glucose Monitor helps patients deal with diabetes more comfortably than ever before. Diabetes is a disease that appears when the body lacks the ability to produce any or enough insulin, causing elevated levels of glucose in the blood. In order to care for this, diabetic patients must track their sugar levels, a task that isn’t always so simple. Patients often track their sugar levels by pricking their fingertip and using a glucose meter to measure their sugar level by the blood sample. Glucose monitoring helps patients manage the disease and avoid associated problems. By understanding their glucose level, patients can make better decisions regarding their food intake, exercise, medication and the like. New devices such as the Continuous Glucose Monitor were invented to assist in better tracking of glucose level for better results. Increased awareness, lowers the risks of potential additional complications and improves the insights gained from monitoring as well as the decisions made as a result. The CGM monitors glucose levels in real-time, throughout the day and night, while providing the user with full mobility. It possesses a tiny electrode called a glucose sensor, inserted under the skin to measure glucose levels in tissue fluid. Information is then recorded and viewed in a monitoring and display device that can alert users before they reach their glucose limits. 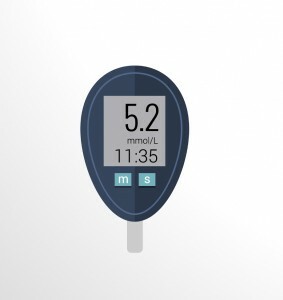 The cable-free wearable glucose monitor allows for better diabetes management amongst users. The CGM displays real-time graphs and trends to measure glucose levels while notifying of high or low glucose reach. This gives users a greater view of glucose trends and potentially better insights regarding their habits and subsequent actions they should take. The developments in the CGM world is still under way and in order to provide the user with the most comfortable experience to a challenging condition, the device should be coupled with a wireless charging solution. This would alleviate the need on behalf of the user to struggle with charging the wearable CGM by providing the user with a drop and charge experience, so that all that is necessary to charge is to simply drop the device in a customized charging station, without the need for cables or unnecessary hassle. When it comes to medical care, we believe that making life easier is key. CGM makes an effort to improve patient care and so do we, with wireless charging. If you are a wearable Continuous Glucose Monitor OEM and interested in integrating wireless charging into your device in order to provide consumers with an easy and natural charging experience, please feel free to contact us.